(left) Annie Liu and Karena Lam, and (right) Anthony Wong and Alex Fong. The Skinny: Impressively mounted mob film is sometimes mesmerizing and sometimes felt. It's also bombastic, pretentious, and ultimately ridiculous. Ah Sou is a textbook example of what happens when a filmmaker takes himself a mite too seriously. Interesting and watchable, but not truly successful. Last year, Wong Ching-Po made Jiang Hu, a ballyhooed mob film that announced his appointment as a "Hong Kong Cinema director of the future." The label was spread about by everyone from Eric Tsang to Andy Lau to probably Wong Ching-Po himself, though it was actually fairly accurate. 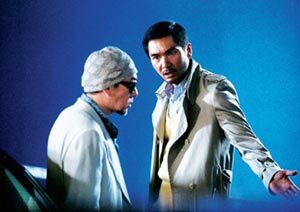 Jiang Hu didn't reinvent the Hong Kong gangster film, but it was legitimately interesting and exceptionally well-made. The main flaws: an inflated sense of self-importance and a predictable twist ending. Wong Ching-Po's follow-up film Ah Sou (AKA Mob Sister) is also interesting and exceptionally well-made, and thankfully, doesn't have a twist ending. Unfortunately, Ah Sou is also self-important, and on a scale that's staggering in its sheer garishness. Prepare to be bludgeoned. Newcomer Annie Liu turns in an unimpressive debut performance as Phoebe, a young woman who survived a family massacre at the hands of blazing angry mob sister Nova (Karena Lam, playing waaay above her true age). Phoebe's dad (character actor Liu Kai-Chi) handed her to respected big brother Gent (Eric Tsang), who brazenly claims that Phoebe will one day become his wife when she turns eighteen, the implication being that if Nova offs the girl, she'll be offing the future Mrs. Gent. The claim doesn't deter Nova one bit, but a nice slapdown from Whacko (Anthony Wong) stops her right quick. Whacko is an old triad pal of Gent's, and is joined by Buddy (Alex Fong) and Chance (Simon Yam) to form a quartet of too-awesome triad dudes, all of whom would give their lives for Phoebe. The girl grows to young womanhood, and comes to know Gent as her father, and the other three as her uncles. But Nova is still out there, thirsting for Phoebe's life. When Phoebe returns from her schooling in the states, there's an immediate attempt on her life, but it's stopped by her four protectors, plus Gent's bodyguard Pilot (the terrific Liu Ye), who seemingly would also give his life for Phoebe. Basically, everyone loves Phoebe - though occasionally they need to be shocked into remembering that. When Phoebe is actually promoted to the head of the triad, some of her protectors seem to forget that they cared for her in the first place, leading to plenty of spilled blood, misplaced anger, and bad stuff that could have been avoided by a nice little chat. At the center of this Phoebe struggles to maintain her innocence, even as Nova reappears with a still blazing grudge against the young girl. Can Phoebe stop her uncles from wiping each other out? Can she solve her differences with Nova? And will she realize her puppy love with the pizza boy who wears the red hat? And do we even care? The answer to that: sometimes yes, sometimes no. In Pizza Boy's case, it would be amazing to find someone who actually found his subplot to be integral or interesting, but Wong Ching-Po and screenwriter Szeto Kam-Yuen (once a frequent collaborator of Johnnie To) throw it in there anyway. Of greater interest are the murky partnerships/rivalries between Whacko, Chance, and Buddy, made so in large part due to the actors playing them. Simon Yam and Anthony Wong are two of the coolest actors around, and Alex Fong - while not on the same level of cool as the other two actors - has solid screen presence. Eric Tsang overacts somewhat, but is every bit the triad big brother, and Wong Ching-Po gives each classic introductions. The four are first glimpsed preparing gifts for Phoebe's return from the states, and the sequence not only defines each man's personality, but sets an involving tone and atmosphere for the film. Thanks to the excellent camerawork and effective style, Wong Ching-Po seems to be signaling in the opening minutes, "Hey, this is going to be one damn good movie." It would be great if he could deliver. Unfortunately, he doesn't. The opening sequence is a combination of cinematic dazzle and obvious film school technique, but it works. The problem is Wong Ching-Po doesn't stop. From minute one he pounds on the slow-motion style and cinematic excess, rendering Ah Sou an overdone bit of filmmaking that proves to be just too much. The music score is effective at first, but soon grows overbearing. The cinematography and camerawork, while beautiful and even mesmerizing, get distracting and even obvious in their showy "look at me" flourishes. When Wong turns the camera on its side to follow Phoebe running down the street, the only thought is, "What the hell was that for?" The same goes for all the slow motion, which is sometimes effective (a forest chase sequence is involving) and sometimes annoying (the climactic multi car pileup seems to go on for twenty minutes). Wong's varied use of filmmaking technique is appreciable, but after a while it becomes just too much. Still, such overdone technique is not the kiss of death for every film or every filmmaker. Witness Wong Kar-Wai, whose films are loaded with MTV-style film technique and still manage to earn the admiration and respect of cinephiles worldwide. However, what Wong Kar-Wai does manage to do is tie emotion to technique, and he balances his "director as star" tendencies with fine acting and an undercurrent of actual emotion. Wong Ching-Po's love of obvious filmmaking technique seems less about character and story and more about pulling a new rabbit out of his filmmaking hat every ten or so minutes. Some restraint would be nice.